After six wonderful weeks, it was finally time to end the first phase of our summer adventure and leave Southeast Alaska. Our time here seemed to fly by, and we thoroughly enjoyed our extended stay. I’m so glad we originally set aside a month to visit the many towns along the Inside Passage. This area is very special and getting around by ferry has been a unique experience. 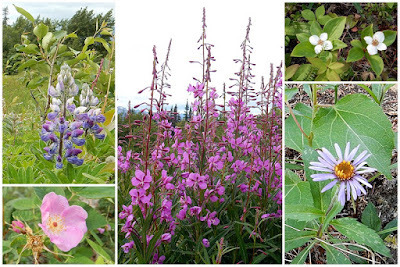 On Tuesday morning we put the RV in gear and headed north on the Haines Highway. 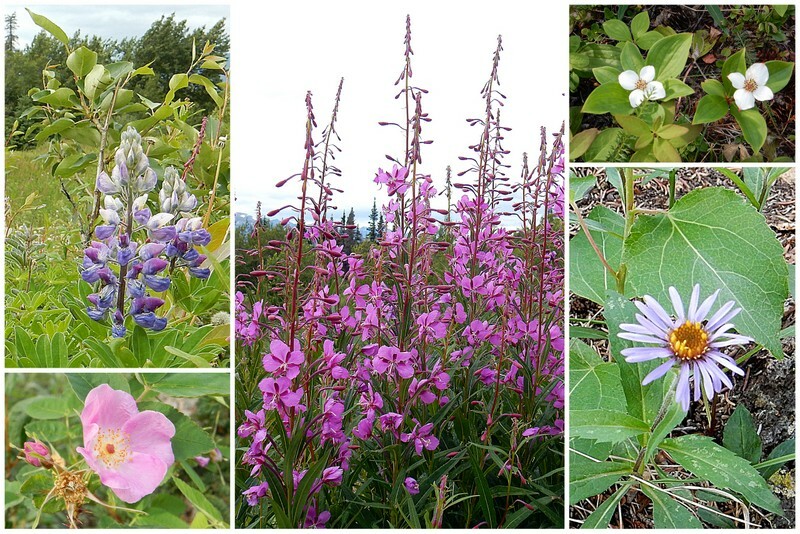 Destination – the Yukon and the interior of Alaska. Thus began the start of the second phase of our adventure. This area is much more of an unknown to us as we’ve done only a bit of research on what there is to see. We have no plans and only a general idea of the direction in which we are headed. Southeast Alaska was much more scripted. Now we’ll be flying by the seat of our pants. I can’t wait! After a quick stop at the grocery store, we were on the road by 10:30 am, which is pretty good for us. We aren’t exactly morning people, although we’ve had our fair share of early mornings so far. The skies were overcast, but no rain was forecast, and I was looking forward to getting back on the road. The Haines Highway has been designated as a National Scenic Byway, and the road lived up to its reputation. We followed the Chilkat and Klehini Rivers before reaching the Canadian border after just 40 miles. Entering into Canada could not have been easier. Just the few standard questions and a quick scan of our passports, and we were on our way. Tim was happy he didn’t have to stop at Immigration this time. After passing through the northern tip of British Columbia, we soon crossed into the Yukon. Despite the overcast skies, the drive was just as beautiful as I had hoped. We climbed from the coastal forests to the alpine tundra and were treated to stunning glacier and mountain views in all directions. As we climbed to the Chilkat Pass summit, the clouds were especially dramatic. We really felt as if we were in the middle of a vast wilderness. For the most part we were alone on the highway. We passed only a handful of cars and RVs heading south, but no one was going in our direction. The road was in great condition, except for a several-mile stretch that was under construction. While we waited for the pilot car to guide us through the construction zone, we had a nice chat with the flagger. I’m sure this road will spoil us for what we know to be ahead. We’ve heard the warnings for the section of the Alaska Highway on which we will soon be driving. In addition to the dramatic scenery, the highlight of the day was seeing a large bear crossing the highway just in front of us. Tim and I both spotted him at the same time, we and were able to stop and watch him for a short while before he disappeared into the woods. That was very cool! It’s also how I like to see bears – from the safe confines of the RV. We had thought we would drive about 240 miles today, but we forgot about losing an hour as we crossed into Canada, plus we hadn’t driven in quite a long time. So, after only 135 miles we pulled into Kluane National Park and decided to stop for the day. Kluane contains the largest non-polar icefields in the world, as well as Canada’s highest mountain, Mount Logan. Kluane National Park and Reserve, Wrangell-St. Elias and Glacier Bay National Parks in Alaska and Tatshenshini-Alsek Park in British Columbia form the largest internationally protected area in the world. This enormous area is a UNESCO World Heritage Site and is recognized as a globally significant mountain wilderness. Kathleen Lake is one of the very few developed areas within Kluane National Park, and that was our destination. Because it was very windy and cold at the lake, we didn’t tarry. Instead we headed directly to Kathleen Lake Campground and settled in for the evening. Only a few campsites have a slight view of the lake through the trees, but it’s a beautiful campground, and it’s nice to be back in a more natural setting, with lots of privacy, once again. Looks like the second phase of your AK trip is off to a great start. Love all those colorful flowers ... esp. the fireweed. We're on our way! All of the flowers we've seen have been beautiful, including the ones in the towns we visited. We absolutely loved the Haines Highway. It was gorgeous, and so peaceful. What I can't figure out is how you made it all the way to Tok in one day. We were ready to stop before Haines Junction!